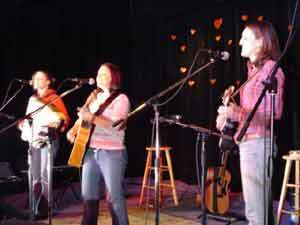 Rocketown recording artist Alathea made a recent concert appearance at the Cup O Joy Coffeehouse in Green Bay, WI. 30-CC caught up with the band for an interview. What follows are a few excerpts. AlatheaMandee Radford: Hopefully when we play music people will not see us as the truth but will see through us and see Jesus as the truth. . . . 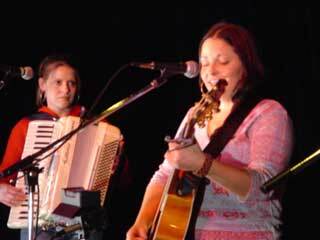 When it comes to the heart of it, we are a pop-folk band and we love bluegrass instruments. . . . We're really defined by acoustic instruments and harmonies and fun. 30-CC: Last year the group released the CD "What Light is All About." What has been the audience response? Christi Johnson: We did this independently for six years, so its been a new thing to have the CD in stores. Its new for Christian music to have all of these Appalachian sounds. But its gone really well and we're excited about making our next record. . . .
Alathea30-CC: What are the groups plans for 2004? Mandee Radford: We are in the early stages of working on a new record. We've written all of the songs and we're about to go into the studio. We're really looking forward to what we have to offer. . . . We're excited to try some new stuff in the studio and stretch ourselves musically.